It all started with the question of which approach will be faster – encrypt just the pieces of data in a file that need encrypted – or encrypt the entire file? Take for example, a books.xml file where the <author> element value must be encrypted. Is it faster to encrypt the entire file, or just the individual author elements, or will it not matter because disk IO is a huge bottleneck? These are the types of scenarios that are easy to hypothesize over, but it’s also easy to whip up some code to produce qualitative answers and put the answers in colorful charts that can be printed on glossy paper and hung on an office wall where a visitor’s natural reaction will be to ask “what’s this?”, at which point you can bombard your visitor with minutiae about symmetric encryption initialization vectors and after 10 minutes they will want to leave without remembering that they had first come into your office to ask about that nasty work item #9368, which you still haven’t fixed. But as for the code, first we need a method to time some arbitrary action over a number of iterations. Then some code to encrypt an entire file. Then some code to encrypt just the author fields. The results of the benchmark on the small books.xml file (28kb) showed that encrypting individual fields generally came out 3-25% faster than encrypting an entire file. Such wide variances made me suspect that disk I/O was too unpredictable, so I also ran tests where the timing took place on in-memory operations only, and all disk IO took place before the encryption work, like with the following code. 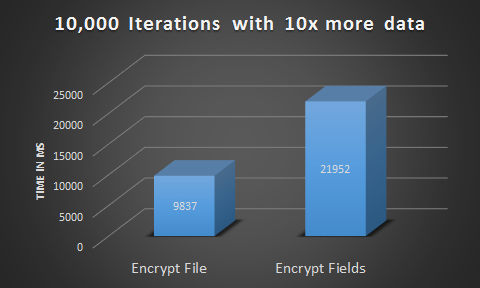 Now the results started to show that encrypting one big thing was a regularly 20% faster than encrypting lots of little things. 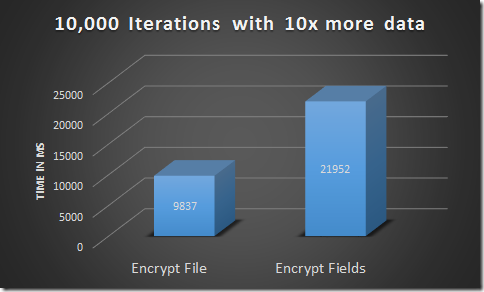 The larger the input data, the faster it became to encrypt all at once. Then after playing with various parameters, like different provider modes, an amazing thing happened. I switch from AesCryptoServiceProvider (which provides an interface to the native CAPI libraries) to AesManaged (which is a managed implementation of AES and not FIPS compliant, but that’s a topic for another post). Encrypting the entire file was 6x slower with managed code compared to CAPI, which wasn’t the surprising part. 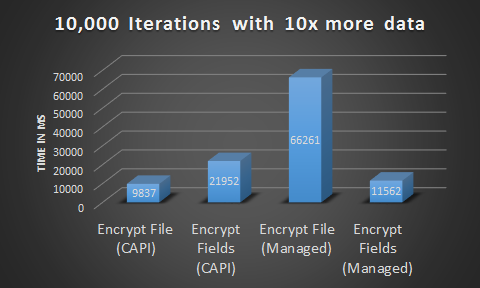 The surprising part was that encrypting fields with AesManaged was much faster than encrypting the entire file with AesManaged, and in fact, encrypting fields with AesManaged was almost twice as fast as encrypting fields with AesCryptoServiceProvider, and almost as fast as encrypting the entire file with a CSP. After double checking to make sure this wasn’t a fluke, I came to three conclusions. 1. Once again, benchmarks prove more useful than a hypothesis, because the numbers are often counterintuitive. 2. It must be much more efficient to reuse an AesManaged provider to create multiple crypto streams than reusing an AES CSP. 3. There is still enough variability that testing against sample data like books.xml won’t cut it, I’ll need to work against real files (which might easily hit 500MB, maybe 1GB, but I hope not). This is the point where people smarter than me will tell me everything I’ve done wrong. My worthless suggestion is to make the Time method a little neater using Stopwatch.StartNew() to save newing one up and then starting it. Did/will you try this on other systems to see whether your graphics card makes a difference? I would imagine the better optimised encryption methods might well make use of the GPU cores - but I'm guessing / showing my ignorance; yet again ;). From a security point of view, I think it's better to encrypt the entire file, not just the fields. This way you give the attacker less information to work with. If you encrypt small pieces of data, the attacker has the correct encrypted text for many inputs and could use that somehow (perhaps he could narrow down plain text values from the context of the field). If you don't use signing than the attacker could pass you correct encrypted fields from another part of your document and you couldn't detect that. @Lucian: Thanks, Lucian, that makes sense. Looking at just the in-memory encryption of fields benchmark and difference in performance between AesCryptoServiceProvider and AesManaged: Could the reason be that CAPI is a C++ library and .NET has to transition multiple times between two different memory models? 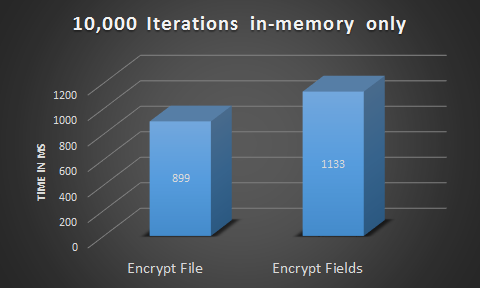 With the encrypt-the-file-at-once benchmark it seems like there would be only transition because the complete byte array is given all at once. 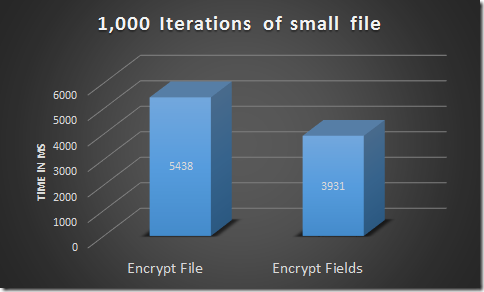 It would be interesting to see what the results would be if you encrypted the file 100 bytes at a time.